This package got me relatively excited. It was sitting on my desk when I came home from school today and it didn't take me long to realise who it was from. Plenty of tea (La Bonne Verveine), chestnut spreads (La Creme de Marrons de l' Ardeche), Strawberry with Provins rose petals preserve (La Coufiture de Fraise aux petales de roses de Provins), Chamomile tea and Valrhona chocolate, and last but not least, her homemade Hazelnut Chocolate Chip Biscottis. Can you imagine the big smile on my face? It certainly made my day. Considering that I had a long day at school and was feeling extremely exhausted. Somehow, this package cheered me up so. I loved her biscottis and couldn't stop eating it. I had to quickly put it in a jar and keep it away, lest I finish it too quick. I'm so gonna have it with coffee first thing tomorrow morning. Thanks so much Flo! They're really gorgeous... love the chocolate bits. Yes, I'm such a chocoholic. 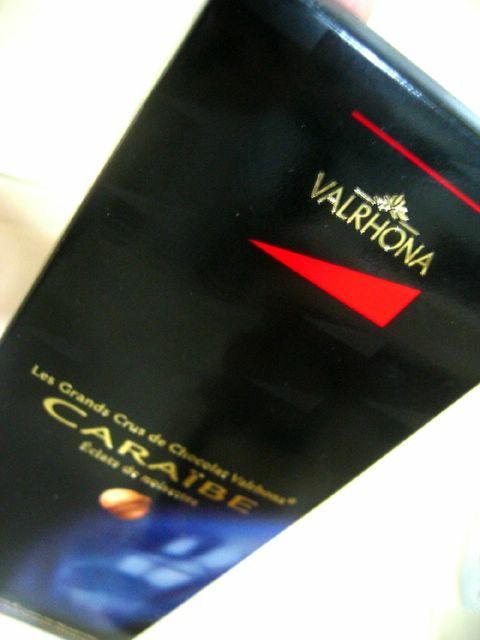 VALRHONA. It just had to be it. 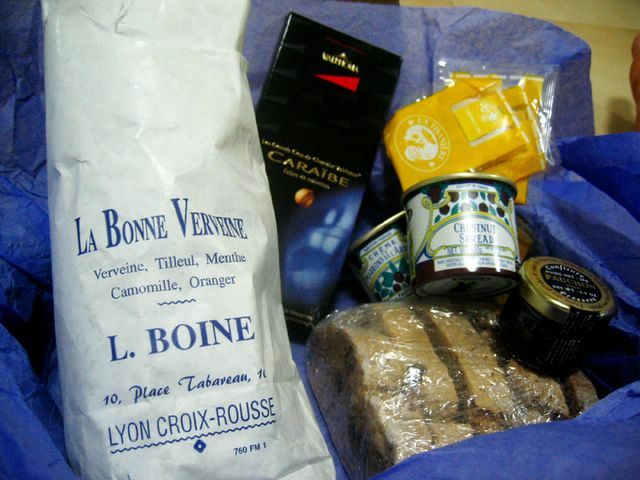 These french chocolate make me go weak in the knees. I fell in love with valrhona ever since I tried it at some dessert place. It was some molten chocolate cake I had I think. 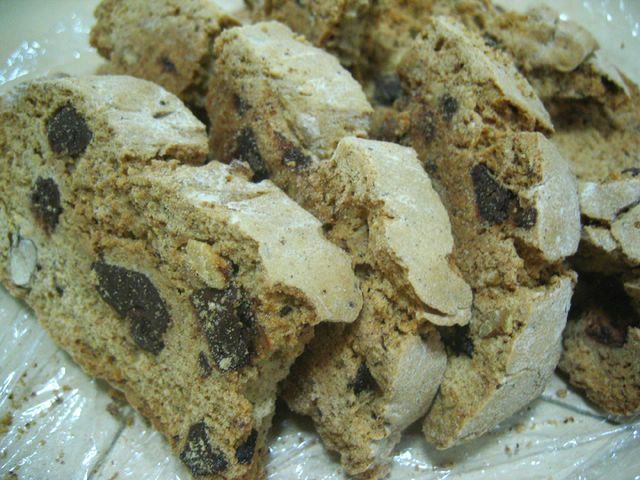 And it was made with Valrhona. Anyway I'm not going to gobble down this bar anytime soon. Plan to save it for another time. Maybe when I feel like indulging. After all, it's not everyday that I get Valrhona chocolates in the mail. Oh Flo, really, thank you so much! 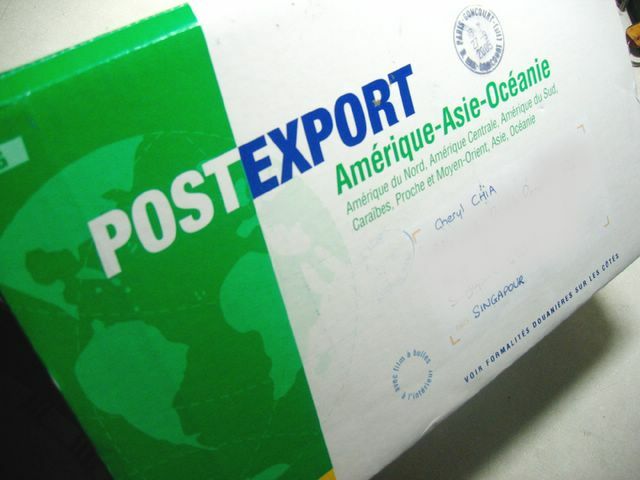 There you have it... Flo's Blogging By Mail package all the way from France, to Singapore. Amazing huh? I've never visited the place before but I would have you know that it's one of the cities I do hope to go to one day. I want to enrol into Le Cordon Bleu or the French Culinary Institute and take up a degree in patisserie. That's just how crazy I am about baking! But first I must save up. And learn the french language. Well I actually studied it for 4 months once, but i've since forgotten how to use it. haha but i do intend to take it up again. When I do, Flo, I'll definitely practise my French by writing French emails to you. hahaa.. or maybe write some posts in French! And... that's a wrap! Until next time, au revoir! P.S. Head to Samantha's (The Samantha Files) for the round-up of the second edition of Blogging By Mail and if you want to sign up for the next one, you can do so at Cathy's (My Little Kitchen). Hi, i simply adore your blog! Please update more often? Can u gimmi some advice? thanks a million! heya michie, yes, you should take part. it's loads of fun. 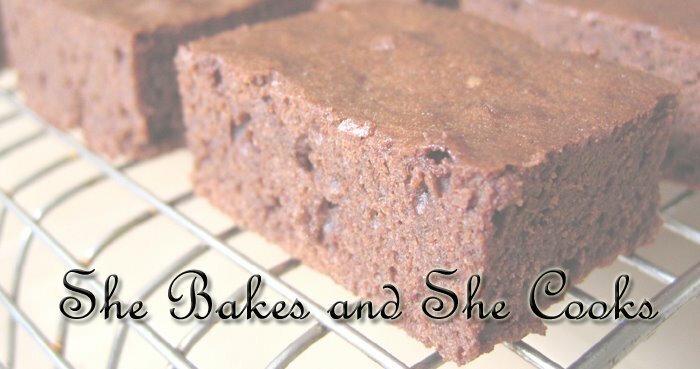 you get to taste other people's homemade goodies! awesome stuff. wah the kueh salat was fun... first time making it. haha ya small world huh? 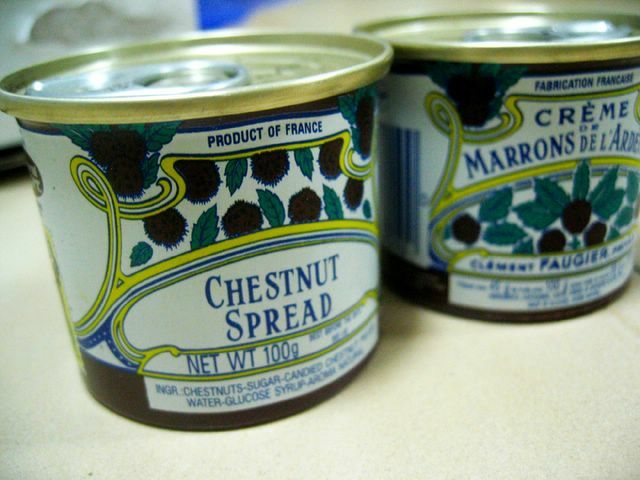 Looks great - especially the chestnut spread - what does it taste like? Just thought I let you on something that I read yesterday, Valrhona chocolates are available in a corner of Amara hotel. there's another branch at ..... think international plaza? Thought you like the information!